Americans now spend most of their waking hours watching TV, listening to music, using apps on their smartphones, or otherwise consuming media, a new study finds. 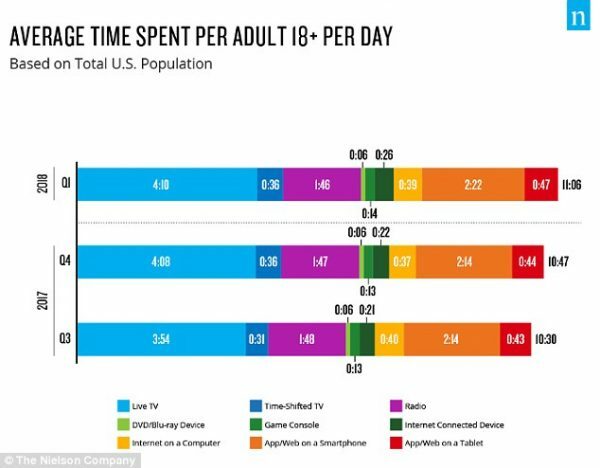 US adults are spending more than 11 hours a day on average—or about two-thirds of their waking time—consuming media in some form, Nielsen showed in its first-quarter 2018 report on US media consumption today (July 31). It measured, based on its representative panels of TV, radio, and digital households and consumers, activities like watching TV and DVDs, listening to the radio, visiting apps on a smartphone or tablet, and using the internet and game consoles. No wonder we don’t have time to do anything else. It really surprised me how little time Americans spend watching DVDs. I suppose that since everything is going digital that DVDs will someday be relics of a bygone age, but we aren’t there quite yet. Though older generations generally spend the most time with media (adults 35-49 spend over 11 hours a day on it, while adults 50-64 do so at a nearly 13-hour clip), younger generations are at the forefront of TV-connected device and digital usage. If it seems like young people are constantly on their phones, that is because they are. Smartphone use is at an all-time high, and it keeps going up every year. We’re often told to limit the amount of screen time in our daily lives, but for many of us, we don’t have much of a choice. A new study finds the average office worker spends nearly 1,700 hours in front of a computer screen over the course of a year. According to a survey of 2,000 office workers by contact lenses manufacturer Acuvue, office workers spend about 6.5 hours a day sitting in front of their computer. So when you add the amount of time we spend staring at screens at work to the amount of time that we spend staring at screens at home, for many of us it pretty much takes up almost all of our waking hours. Is this good for our society? And we should talk about who controls all of this media that we are consuming. Today, approximately 90 percent of the programming that comes through your television is controlled by just 6 giant media corporations. Of course those 6 giant media corporations are ultimately owned by the elite of the world. So if you spend several hours watching television each day, you are allowing “the matrix” to fundamentally shape what you think, what you believe and how you view the world. At least on the Internet there has been more diversity of viewpoints, but now there is a massive effort to censor alternative voices. The elite are attempting to become gatekeepers in the digital world just like they are with every other form of media. WND and the rest of the independent media are feeling the heat from the Internet Cartel, which controls traffic, revenue, search power, hosting and distribution of news and information through social media, not to mention retail sales of all books. It’s a scary time of rapidly shrinking traffic and revenues. WND, for instance, has seen drops in revenue from more than $10 million in 2016 to $6 million last year to perhaps as little as $4 million in 2018. All other forms of media are already completely dominated by the elite, and so we must not allow them to take full control of the Internet. If you want to change society, it won’t do you any good to go out to the street corners or to the marketplaces because nobody will listen to you. If you want to change society, you have to go online, because that is where the people are. Right now we are in an information war, and the future of our country is hanging in the balance. So let us fight this information war as hard as we can, because losing is not an option.